This was my Mom's recipes as simple as it is, but so good. And she got it from her mother, and so on. You can see how this was no doubt a cheap, inexpensive way to stuff a bird back during the depression and even before. Most people back then had gardens and baked their own bread. You can doctor it up with extra added ingredients to make it your own. Now please be advised. I tend to cook from memory. I don't measure so these are not exact. I taste - so I suggest you may have to do the same. These are only guesses as to the approximate measurements. 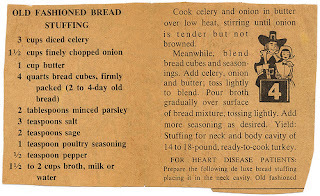 About 8 cups of dry unseasoned bread cubes or 14-16 slices of bread cut in 1/2 inch cubes. Melt 6 tbsp of butter and add 1 1/2 cup turkey or chicken broth (water is okay too) Add some chopped parsley about 1/3 cup. Mix all together in a big bowl and stuff loosely. For Giblet Stuffing: Cook in lightly salted water to cover. Drain and chop. Use Giblet liquid as part of the broth. 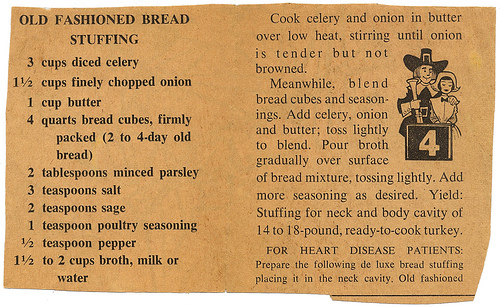 add to stuffing. I don't like raisins, or cranberries, or sausage etc in my simple stuffing. But this can be easily be the base for your add ons.